The Integrated Modular Pelvic Bolster for the 2018 Lincoln Navigator won top honors in the SPE Automotive Division’s Body Interior category. The bolster reduces part complexity by eliminating two crash foams and replacing them with a single injection molded piece. Photo courtesy of SPE Automotive Division. LIVONIA, Mich.—Faurecia, in partnership with Ford, received two 2018 SPE Automotive Innovations Awards in the Body Interior and Safety categories for the 2018 Lincoln Navigator and 2019 Transit Connect, respectively. Ford earned 5-star safety ratings for side impact crashes on both vehicles. 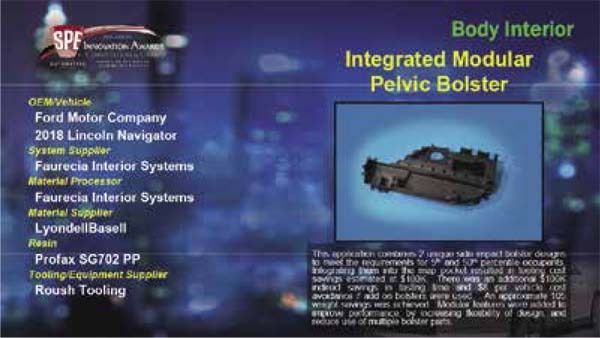 The joint Faurecia-Ford Integrated Modular Pelvic Bolster took top honors in the Body Interior category. The pelvic bolster is reported to reduce part complexity by eliminating two crash foams, replacing them with a single injection molded piece. The new design, which is integrated into the side panel, delivers cost savings and improved safety. The unique bolster is highly adaptable and can be easily implemented into the vehicle architecture, according to a release from Faurecia. Faurecia and Ford also collaborated for the Door Trim Interlocking Mechanism for side impact on the Transit Connect, winning the top prize for the Safety category. This innovation replaces traditional metal stiffening brackets with a plastic design, resulting in significant cost savings and safety improvements. The innovation reduces the separation between the armrest and the door grab handle. The bracket, made from ABS plastic, provides a sturdier support and increases thermal resistance, Faurecia said. The Door Trim Interlocking Mechanism for side impact on the Transit Connect was the winner in the SPE Automotive Division’s Safety category. The mechanism replaces traditional metal stiffening brackets with a plastic design, resulting in significant cost savings and safety improvements. Photo courtesy of SPE Automotive Division. 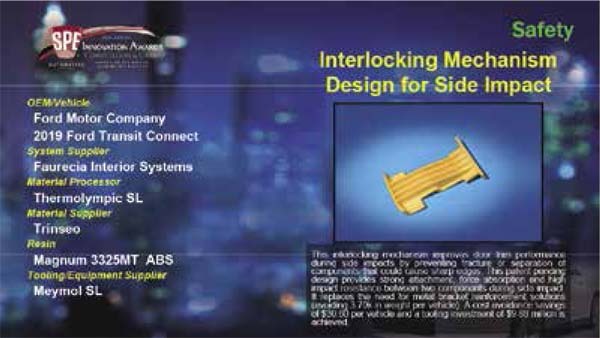 According to the SPE Automotive Division, the pelvic bolster for the Lincoln Navigator “combines two unique side-impact bolster designs to meet the requirements for 5th and 50th percentile occupants.” Integrating these designs into the map pocket is said to have saved an estimated $100,000 in tooling costs. The bolster is also reported to have indirectly saved an additional $100,000 in testing time. The Door Trim Interlocking Mechanism for the Transit Connect “improves door performance during side impacts by preventing fracture or separation of components that could cause sharp edges,” according to the SPE Automotive Division. It is a patent-pending design that is said to provide strong attachment, force absorption, and high impact resistance between two components during side impact. The Society of Plastics Engineers’ Automotive Innovation Awards program is said to be the oldest and largest competition of its kind in the automotive and plastics industries. Several teams from OEMs, tier-1 suppliers, and polymer producers submit nominations describing their part, system, or complete vehicle module for consideration as the year’s most innovative use of plastics. Faurecia and Ford also teamed up to win an SPE Automotive Innovations Award last year, when the companies took home the Process and Technology award for decorative components in the instrument panel of the 2017 Ford Fiesta Vignale.